/way 14.78 23.90 This is a waypoint! 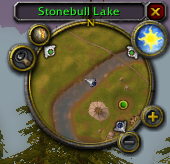 When you set a waypoint, a dot will appear (green) on your minimap. When it goes out of range of the minimap display, it will turn into an arrow, just like the default UI. You can mouse over these waypoints to get detailed information about that waypoint. Add code to allow TomTom specific overrides of HDB data. Protect against orphan maps, which the latest HBD now discovers. Assume that the lowest numbered mapId is the primary. Blizzard, yiu drive me crazy. Restrict mapTypes to Zone and Micro. Update CrazyArrow on ZONE_CHANGED as well. Add missing argument to SetClampedToScreen(). Add /tway arrow to print arrow status. Possible to disable TomTom notification spam? Can the notification spam about adding or arriving or pretty much anything that gets prefaced "TomTom: " get toggled off? In the General Options page, there's a tickbox that suggests it enables "Announce new waypoints when they are added", but neither ticking nor unticking the box stems the flood. Is it at least possible to divert the messages away from the default chat frame? I could set up a /dev/null chatframe, and that would be welcome respite. FishingBuddy has updated to an alpha version of HereBeDragons which is giving TomTom indigestion. I'll issue a patch to deal with the maps with no parents in a few hours. Where were you when this error happened? Did the error occur on login or afterwards? But not with Tomtom directly, and not in broken BfA state of minimap. Can I directly create a waypoint on the minimap? Say... ctrl right click? This happened on the last step of Pebble 13 on the way to the B'aal pet. At the point it comes up I was submerging, from my Anglers raft, into seal form. I'm a druid. Where this happens is only visible on the world map, you end up about half way to the Broken Isles after setting off from Vol'dun! My guess is it's trying to work out a map and there isn't one? Whatever the case is I thought I'd mention it. Arathi Highlands:Eastern Kingdoms doesn't work. Last edited by spakytwo : 11-04-18 at 07:42 PM. Last edited by diveX : 10-30-18 at 11:33 AM. There seems to be a map stacking issue. 1. Go to, f.e., Razor Hill. 3. Set waypoint to Ratchet FP. 4. Fly on your mount into said waypoint. 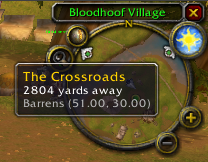 You're in the Northern Barrens now, and even though waypoint arrow is working, the waypoint never "reached". No proximity notification, no clearing. how do i get tomtom to goto nearest waypoint as it doesnt seem to be doing so? Make "/cway" your last Paste'd command. Plus make sure next waypoint is allowed to be outside current zone. Thanks for the wonderful addon. Appreciate this project being worked on year after year. I prefer to the waypoint arrow to near the top center of the screen. I use the 'Lock waypoint arrow' option and the same Waypoints and Options profile between characters. For raids, etc. I turn off all my addons except the bare essentials. When I turn TomTom back on again later, the location resets to the default position. How do I make the addon remember my preferred location How do I make it "stick" between characters? In short there's no easy way to do that right now because of the way I coded this like 6 years ago. 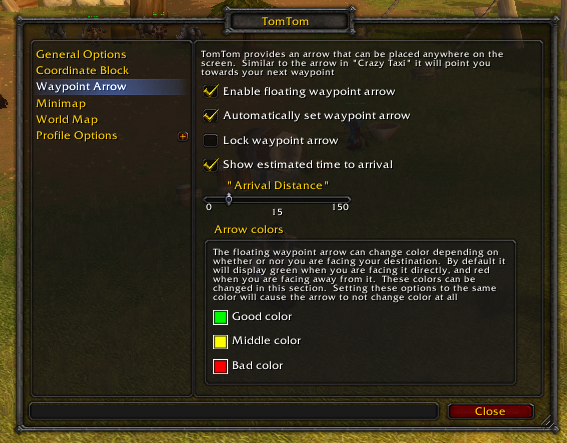 It relies on some Blizzard tooling that doesn't work when you enable/disable addons like this. Updating that code wouldn't be too terrible, but I'm not sure if/when I'll have time to do it to store it in the saved variables the same as all of the other settings. 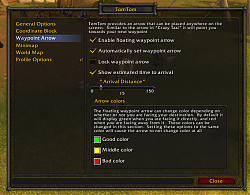 Is the arrow working for others for the World Quests in Legion and BfA? If it's working for others I need to work out why mine isn't working.